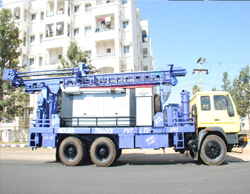 BEAVER 1500 Model, Truck Mounted Hydraulically Operated Water Well Drilling Rig can capable of drilling from 6” to 8” Dia. 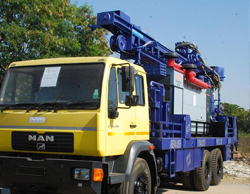 Bore Holes in different formations such as hard rock by DTH method, Unconsolidated / alluvial formations using water / foam flush by Rotary method & Unconsolidated / Gravel / Boundary Formations using ODEX tools up to a depth of 450 Meters (1500 Ft.) under favorable Drilling Conditions. The hydraulic pumps shall be powered by either same truck engine through PTO or by a separate diesel drive deck engine. It can be mounted on single truck version or two truck version.